The financial performance of the small Joan Mitchell painting (at right) that I mentioned in my last post provides an interesting case in point. The piece sold for $51,000 (including buyer’s premium) this week—just about at the mid-point of its presale estimate. I wanted to determine how well the painting did as an investment for its owner, and I started with the Inflation Calculator. 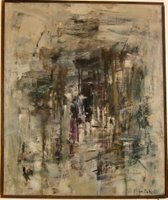 It told me that $125 in 1955 dollars (the year the owner bought the piece from Mitchell’s gallery) is the equivalent of $859 in 2005 dollars. So this lucky early supporter of Mitchell’s work beat inflation (which averaged 3.9% per year over that period) significantly with his or her investment. By how much, though? To figure that out, I calculated the compound annual growth rate (CAGR) of the investment. Of the $51,000 purchase price, the seller took home a bit over $38,600 after the buyer’s premium and seller’s fee were subtracted. That means that this investment appreciated on average 11.9% per year over the period that the owner held the painting. While the painting has outperformed these benchmark indices, it hasn’t shown a truly stupendous return. Well managed hedge funds will return 15-20% CAGR over a lengthy period. While the return on this little Joan Mitchell painting has been about as good (on a pure percentage basis) as could possibly be, when time is taken into consideration by looking at CAGR the return isn’t amazing. It did beat the market by a wide margin, but a smart asset manager can do significantly better. Related: CAGR analyses of the secondary art market seem to be in the air this week. Next: what this painting (and a similar one) tell us about recent theories of art as a viable investment vehicle.